The first meeting of Canada’s new Foreign Minister Chrystia Freeland with Russian Foreign Minister Sergei Lavrov backfired when Freeland addressed Lavrov in Russian, and Lavrov replied that speaking in Russian will soon be illegal according to a new law proposed by the Canadian-backed regime in Ukraine. On March 31, Freeland announced that she and Lavrov would be attending the Arctic Council meeting in Fairbanks, Alaska, “and I would be absolutely prepared to have a bilateral meeting with Sergey Lavrov at Arctic Council if that works for both of our schedules.” The Arctic Council, a group of eight Arctic Circle governments, six indigenous community representatives, and several government and organization observers, has been chaired for the past year by the US, and was winding up the American chairmanship at the Alaska session. Freeland has been publicly misrepresenting the record of her meetings with Russian government officials for the past six months, according to this report. 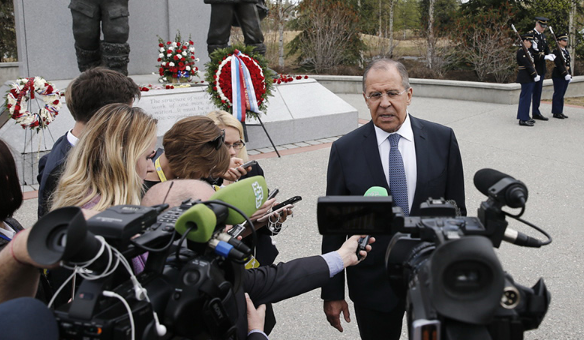 Last week at the Fairbanks session, Lavrov cut Freeland short, and in answer to a Canadian press question, posted in Moscow on Friday morning, Lavrov said there had been “a brief conversation” before dinner. 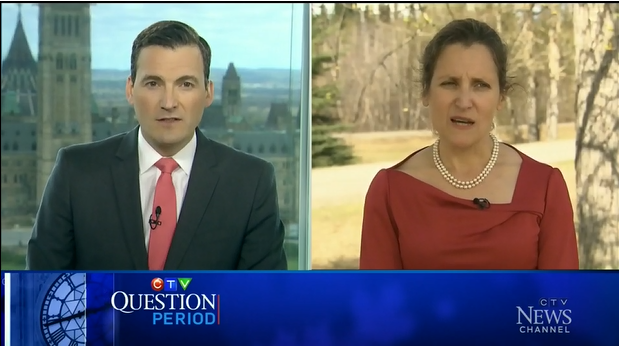 At an interview Freeland gave CTV television network at about the same time, she claimed: “I had quite a few productive conversations with Minister Lavrov, both last night over supper and today”. She added she “did speak with Minister Lavrov and also with the Russian delegation in Russian, which I think was a bit of a surprise to everyone.” Freeland did not report, however, what Lavrov told her. The record from both the Russian and Canadian sides reveals that no bilateral meeting of the kind Freeland proposed earlier actually took place. Freeland did arrange for her Twitter feed photographer to snap pictures of her with Lavrov and the Russian Ambassador to the US, Sergei Kislyak, at a stand-up kaffeeklatch. The meeting shot four times by the photographer from two angles took too little time for the plastic cups to move towards Freeland’s and Lavrov’s mouths. This wasn’t said between them, according to Lavrov, but in open discussion around the delegates’ table at the official dinner. Yesterday [Wednesday evening] we talked at the informal dinner reception that was open to ministers and representatives of the Arctic Council only. Russia-Canada relations were among the topics that were raised. We had a brief conversation ahead of this event. During the dinner the Ukraine issue was mentioned and how it affected Russia’s relations with western countries, which gave rise to a small debate. I highlighted the manifestations of neo-Nazism and chauvinism we are currently witnessing in Ukraine. In fact, radicals have hijacked the agenda from the president and prime minister in our neighbouring country that we care about. I referred to the draft law on the state language whereby, if adopted, all the citizens of Ukraine would have to use only the Ukrainian language in their day-to-day activities regardless of the language they prefer (be it Russian, Hungarian, Romanian or Polish). This initiative is clearly discriminatory and runs counter to the European Charter for Regional or Minority Languages. My Canadian colleague was not aware of this draft law, and I promised to send it to her. A Canadian reporter asked Lavrov: “What are the prospects for removing her [Freeland] from Russia’s black list?” He ignored the question. Freeland was asked: “Did Russian Minister Lavrov say Russia would lift those sanctions against you so that you can travel to Russia?” “That issue was not raised”, she replied.